It is unclear when Dayes actually produced the memoir, but it is likely that he wrote it in the mid 1820’s as a statement of his services when seeking a pension at the expiration of his career. 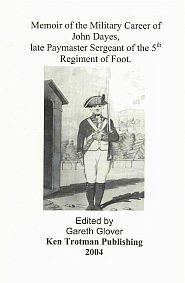 Dayes served his time with the 1st Battalion of His Majesty’s 5th (Northumberland) Regiment of Foot, rising from Private to Paymaster Sergeant during his twenty-three years of service. During the period Dayes describes, his battalion was extremely busy, serving in Holland; Gibraltar; Guernsey; Hanover; Buenos Aries; Portugal; Spain; Walcheren; the Peninsula again and Southern France; Canada; France after Waterloo and eventually home to England. The regiment had a number of sobriquets during the wars, amongst them, The Old Bold Fifth, The Fighting Fifth, and Lord Wellington’s Bodyguard after serving at Headquarters in 1811. Between 1806-14, the 1st Battalion won the battle honours of Buenos Aries, Rolica, Vimiera, Corunna, Flushing, Talavera, Salamanca, Vitoria, Nivelle, Orthes, Toulouse and Plattsburg; whilst the 2nd Battalion added Busaco, El Bodon, Ciudad Rodrigo, Badajoz and Salamanca. Dayes writes his story in a matter of fact way, often frustratingly silent or terse on some aspects of his various campaigns, but he does at times go into much greater depth and adds interesting facts and provides new light to our knowledge of the period. The validity of his account is beyond doubt; much of his statement can be verified with the regimental history and they do agree to a very high level.